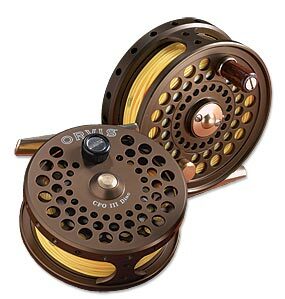 Orvis are one of the best fly fishing tackle suppliers around and have an exceptional range of fly fishing reels. A traditional fly reel is basically a storage for line, most of the work in fly fishing is achieved when the line is pulled of the reel, slack line is then guided through the fisherman’s hand, the length of cast depends on the amount of slack line available. When playing a fish, it’s best that any slack line is quickly reeled in and then played by a method called ‘palming’, this is basically controlling the spool by the palm of your hand, allowing line to be fed out if the fish is fighting hard. I always recommend you reel in slack line, as it’s easy to get in knots with slack line, and you have more control playing a fish when the line is being palmed off the reel. Fly reels are often rated for a specific weight and type of fly line in combination with a specific strength and length of backing. For example, the documentation supplied with a reel may state that the reel can take 150 yards (140 m) of 50 pound-test backing and 30 yards (27 m) of fly line. An angler should be able to “load” the reel with the specified length of line and backing and still have sufficient room between the line and the spool’s edge. As well, many modern reels are designed to take interchangeable spools. Such spools can be quickly switched, thus allowing an angler to change the type of line in a matter of minutes.